Michelle has undertaken a variety of commissions for hospitals, hotels, a department store and design consultants among others. Commissioned works include digital prints on paper, large-scale wall-hangings and textile panels. Commissions are often site-specific and are approached by considering the space and working with the client to establish a colour palette, possible imagery (which may relate to the space or surrounding area) fabrics, scale and positioning of the piece. Michelle has undertaken a variety of commissions for hospitals, hotels, a department store and design consultants among others. Commissioned works include digital prints on paper, large-scale wall-hangings and textile panels. Contact Michelle if you have a project in mind and would like to discuss a commission. Having seen Michelle’s work at Contemporary Applied Arts, Sir Nicholas Goodison recommended to the British Academies Art Committee, that they should commission her to make two large wall-hangings to fit two alcoves on their main staircase. Her work now hangs in place as part of their impressive art collection in Carlton House Terrace, St James’. Inspiration for the artworks was drawn from the architectural detail within the interior and the impressive book collection in the two libraries at the Academy. Pigments were used to paint and print photographic imagery and graphic blocks of colour using hand cut paper stencils. Materials used were a natural flax linen, union linen, cotton satin and Tudor cotton/linen. To find out more about Michelle's commission, view her page on the British Academy website. The designs for the left and middle wall-hangings were based on two of Michelle's earlier pieces, 'Tea's Up: Purple' and 'Tea's Up: Yellow'. Whilst researching makers work at CAA, for the exhibition 'A living Space: Curated by Kit Kemp', Kit Kemp had the idea to include these works within the show. However much larger artworks were needed, so Kit commissioned Michelle to print the three new pieces seen here. Having selected two sections of her hangings which she particularly liked, CAA then asked Michelle if she would be willing to create these new larger pieces. She accepted the invitation and then went about scaling-up the imagery and in turn the silk screens, to paint and print these one-off artworks. The hanging on the right was a completely new piece that Michelle designed to go with the other two. All three hangings were printed in sections, before the next stage of matching up printed areas and carefully piecing them together. Dyes and pigments were painted and printed by hand onto linen union, drill cotton satin and wool flannel. 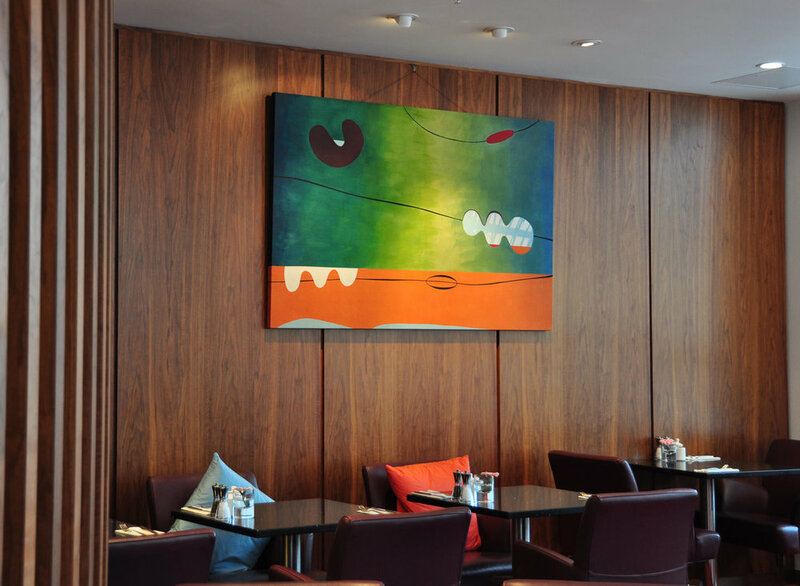 The artworks are now situated in Ham Yard Hotel, Soho, London (Firmdale Hotels). Kit Kemp is a designer and co owner of Firmdale Hotels. Her concept for the exhibition was to create a Bloomsbury-Group inspired living space within the gallery of CAA. Client: Peter Jones Department Store, 2nd Floor Cafe. An art consultant working for the John Lewis Partnership, contacted CAA gallery with a view to commissioning artwork for their soon-to-be re-furbished store in Sloane Square. Michelle was selected to carry out the commission for the 2nd floor cafe at the Peter Jones. Following discussions and meetings with the consultant and interior design team, Michelle was given colour samples for the interior furnishings and set about designing the textile artwork. The finished panel was hand-painted and printed with dyes and pigments onto linen union and cotton sateen, then stretched over a wooden frame. When Michelle first visited the site of the Hove Polyclinic, the building was still in the early stages of construction. With architects plans and a brief from the client, Michelle started researching and photographing the local area – collecting images of deckchairs, the local windmill and architectural details from Brighton and Hove. The wall-hanging was painted with dyes, then hand-printed using pigments and discharge. Metal eyelets were used as fixings to reference the sails and tarpaulin found on sailing boats. When Michelle first visited the site of the Hove Polyclinic, the building was still in the early stages of construction. With architects plans and a brief from the client, Michelle started researching and photographing the local area – images of deckchairs, pebbles and the weather vane from a local landmark along the seafront were used, along with 'porthole' graphic circles. The wall-hanging was painted with dyes, then hand-printed using pigments and discharge. Metal eyelets were used as fixings to reference the sails and tarpaulin found on boats.